(CNN) -- "As we stand at this crossroads of history, the eyes of all people in all nations are once again upon us -- watching to see what we do with this moment; waiting for us to lead," President Obama said Tuesday night. Obama said the United States had fallen behind other nations, but still had the ability to shape the world. "Those of us gathered here tonight have been called to govern in extraordinary times. It is a tremendous burden, but also a great privilege -- one that has been entrusted to few generations of Americans. For in our hands lies the ability to shape our world for good or for ill."
Obama's first speech to a joint session of Congress was a rousing call to arms and optimism. 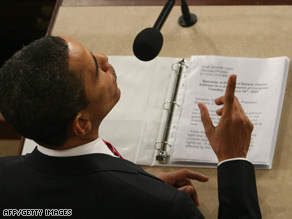 Over 52 minutes, the president laid out a road map for the confidence required to kick-start the U.S. economy. And the global village was listening too, eager to see how the United States will lead the recovery from the infection they believe it spread in the first place. While exhorting America to harness again the inventive genius that made it great, Obama warned that rising powers are overtaking the United States. "We know the country that harnesses the power of clean, renewable energy will lead the 21st century. And yet, it is China that has launched the largest effort in history to make their economy energy efficient," he said. "We invented solar technology, but we've fallen behind countries like Germany and Japan in producing it. New plug-in hybrids roll off our assembly lines, but they will run on batteries made in Korea." Promising to power forward on education in the United States, he warned that many countries are out-educating U.S. children and will therefore better compete in the future global economy. Although Obama did not spend much time on foreign policy, only lightly skimming over key areas and issues toward the end of his speech, he laid out his main objectives again, promising to rein in the trillions of dollars spent on the war in Iraq and seeking a way to stave off disaster in Afghanistan. "For seven years, we have been a nation at war. No longer will we hide its price," he said. To thunderous applause he continued: "I am now carefully reviewing our policies in both wars, and I will soon announce a way forward in Iraq that leaves Iraq to its people and responsibly ends this war. "And with our friends and allies, we will forge a new and comprehensive strategy for Afghanistan and Pakistan to defeat al Qaeda and combat extremism. Because I will not allow terrorists to plot against the American people from safe havens half way around the world. We will not allow it." As Obama now inherits the militants and the terrorism forged since 9/11 he called for America to succeed by standing firm on its own historic principles. "To overcome extremism, we must also be vigilant in upholding the values our troops defend -- because there is no force in the world more powerful than the example of America. "That is why I have ordered the closing of the detention center at Guantanamo Bay, and will seek swift and certain justice for captured terrorists -- because living our values doesn't make us weaker, it makes us safer and it makes us stronger. And that is why I can stand here tonight and say without exception or equivocation that the United States of America does not torture." If leaders in countries such as Iran or Syria were looking for a clear signal on how Obama would follow through on his campaign pledge to engage with adversaries, they did not get it on this night. He simply repeated his general position. "In our words and deeds, we are showing the world that a new era of engagement has begun. For we know that America cannot meet the threats of this century alone, but the world cannot meet them without America. "We cannot shun the negotiating table, nor ignore the foes or forces that could do us harm. We are instead called to move forward with the sense of confidence and candor that serious times demand." He put the Israelis and Palestinians on notice, that his administration would not sit back and watch the Middle East continue its free fall into the abyss. Instead, he said the United States would resume its proper role: "To seek progress toward a secure and lasting peace between Israel and her neighbors, we have appointed an envoy to sustain our effort." Mindful that his first overseas trip as president comes in April to the global economic summit, to be held this year in London, he pledged a return to cooperation and compromise with America's traditional allies. "To respond to an economic crisis that is global in scope, we are working with the nations of the G20 to restore confidence in our financial system, avoid the possibility of escalating protectionism, and spur demand for American goods in markets across the globe. For the world depends on us to have a strong economy, just as our economy depends on the strength of the world's."